Set a rack in upper third of oven and preheat oven to 220 °C. Place 1 tsp of oil (or beef drippings) into each cup of a 6-cup muffin pan. Transfer pan to oven and heat until oil is smoking, about 2 minutes. Remove pan from oven and quickly pour batter into cups, filling 3/4 full. Bake until puddings have risen and are golden brown, about 15 minutes. Serve immediately. You gotta be kidding me? This (flour, fat, milk combo) on a diet? Why is this even on here? 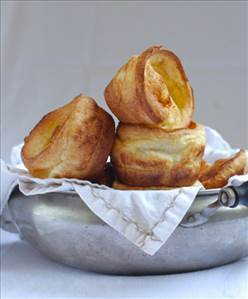 There are 113 calories in 1 serving of Yorkshire Pudding. Calorie Breakdown: 54% fat, 32% carbs, 14% prot.